Welcome to the launch of a new blogging series, Thought Leadership on Thursday, as you may guess from the title this is intended to be a ‘once a week’ thing. Despite the sentiment in Hugh’s cartoon we do need more Thought Leaders, we just need it to be original and leading rather then “me too’ism”. There is no impact without change. There is nothing serious, nothing committed, without a need for change, now, urgently and meaningfully. If you haven’t read the Days of Future Past series, take a look and it might explain the motivation to promote change and revolution. While I have had the idea for this series on the drawing boards for a while, there was another motivation that made it front of mind and, more importantly, acted upon. “Sadly the resilience network is not an enabler for change. It is a profile raising tool. There is no one specific channel to drive all these “observations” through to actual change. Sounds like a call for some real Thought Leadership to me. This series will not be focussed on promoting Past Practices (no matter if the marketing label attached to them is Good, Better or Best). The aim is to promote different ideas, and challenge people to think – rather than simply tell people what they should think. Isn’t “Thought Leadership” just another form of self-promotion? Based on what you generally find on the internet, the term has certainly been debased. I am honoured that I don’t have to claim the label for myself, others have graciously made that observation. One of my advantages is that I am not trying to sell you something, although I do reserve the right to publish a book one day! My company does offer consultancy, but at the moment I sell it by the year in advance and the client already has an option on the 2018-2019 renewal. So unless you have a truely world-leading BC budget, then you cannot afford me – so that removes my only potential commercial bias! There’s no institute of Thought Leaders to lay down standards and tell me how I should do it. Originally the term was suggested as a label to apply to highly influential thinkers. 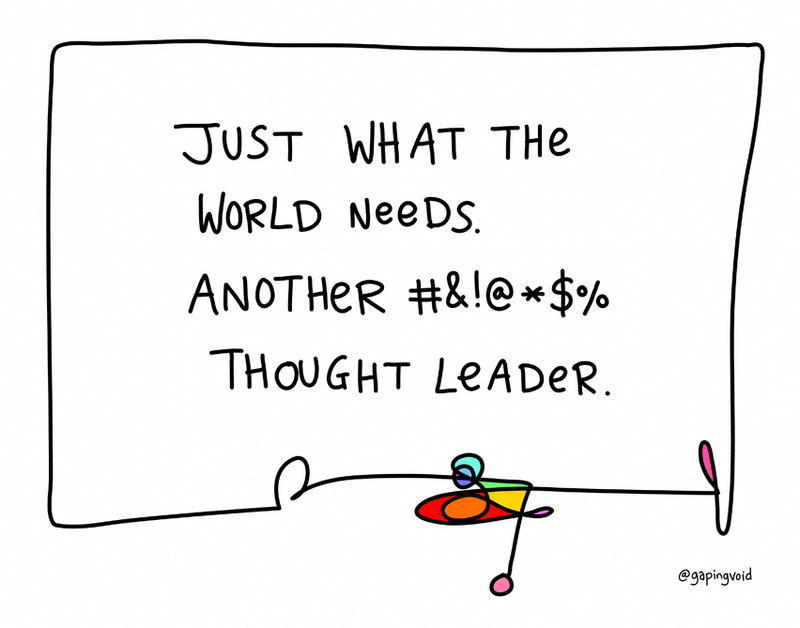 Unfortunately, thought leader has become a buzzword that seems to mean whatever the speaker or writer wants it to mean. That sounds like something I can aspire to, and enjoy myself along the journey. What should Thought Leadership be? Here is a suggestion from Nathaniel Forbes on what a Thought Leader is and what they might do in the BC space. A thought leader is to intellectual cross-fertilization what a bumblebee is to a fruit orchard. A thought leader finds inspiration in unusual places and draws meaning from the work of others, relating global trends to your everyday practice. A thought leader provides context. A thought leader articulates thoughts you haven’t yet had, perceives conceptual relationships you do not yet see, and has flashes of insight you wish you’d had. A thought leader challenges orthodoxy. A thought leader sees a different future and describes it to you in ways that make you believe. A thought leader is a speaker, a trainer, a writer. A thought leader inspires you. Addressing a broader range of risks, including a number of new and emerging risks relating to water scarcity, climate change, population growth, along with one of new favourites cyber conflict. On a similar theme promote the idea that some of the biggest risks to an organization’s operational continuity are not influenza, terrorism or fire – but smoking, obesity, diabetes, hypertension, etc. Preventable threats kill far more employees worldwide most years than all natural disasters combined. Stop talking about “press conferences” and start talking about, and working with, Facebook, Twitter, and blogs today – plus the multitude of new and emerging social media tools that are likely to be the main platforms for crisis communication in the future. What do think Thought Leadership can or should be for you? Let me know your thoughts and ideas. Until next Thursday, you might find some more discussion on the idea of Thought Leadership from the first episode of Beyond the Black Stump.